Cooper has been growing by leaps and bounds, but definitely not in the height department. At his last check-up, he was in the 7th percentile for height and 12th percentile for weight. Head circumference? The growth continues: 75% percentile. I’m not entirely sure how he doesn’t topple over more often. He is regularly speaking in 4-5 word sentences, recognizes a number of colors, and singing along to anything he recognizes. It seems like just a few weeks ago he was singing bits and pieces of the ABC song but now he can sing practically the whole thing plus his bedtime songs (Baa Baa Black Sheep and the Itsy-Bitsy Spider) as well as the kiddie CD that has been playing on repeat in the car for the last 3.5 years. The best part of waking up these days is hearing him through the baby monitor, singing to himself in his tiny little voice. He still seems so little to me since he’s the “baby” but maybe because he still likes to snuggle and requests being carried up and down the stairs or if we end up walking more than a few steps. The thing that put me back in reality is that he is starting to wear all the clothes Maxon was wearing when he was born. Not that he insists on wearing clothes at all times, like Maxon did. These days, you can often see him walking around with only one sock on, having stuffed the other sock between the cushions of the couch. Or if he’s only partially dressed, he’ll run away giggling “naked Cooper!”. There are a few things that are not up for negotiation. One may retrieve his jacket from the coat hooks for him, but don’t even try to put it on him. Instead, you must lay it on the floor at his feet where he will then fit his arms into the sleeve, flip it over his head, and voila! He also has to put on his own hat, which lands with varying success. We’ve also finally switched his car seat to face forward and that opened up all kinds of climbing opportunities. 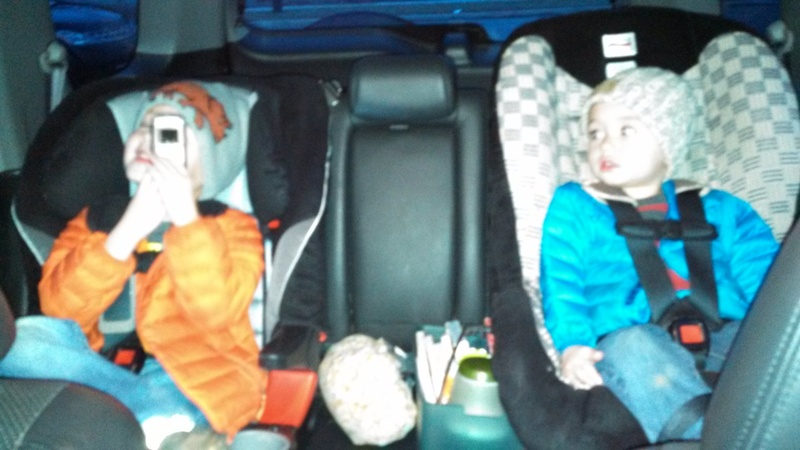 Previously, I would open one side of the car and let Maxon climb through while I placed Cooper in his car seat. Nowadays, I let Cooper in first and let him walk over to the other side of the car and climb into his car seat while I secure Maxon’s seatbelt on. It’s far from graceful but it gets the job done. Last week, we decided to take advantage of a very pleasant evening and ride our bikes out to dinner. 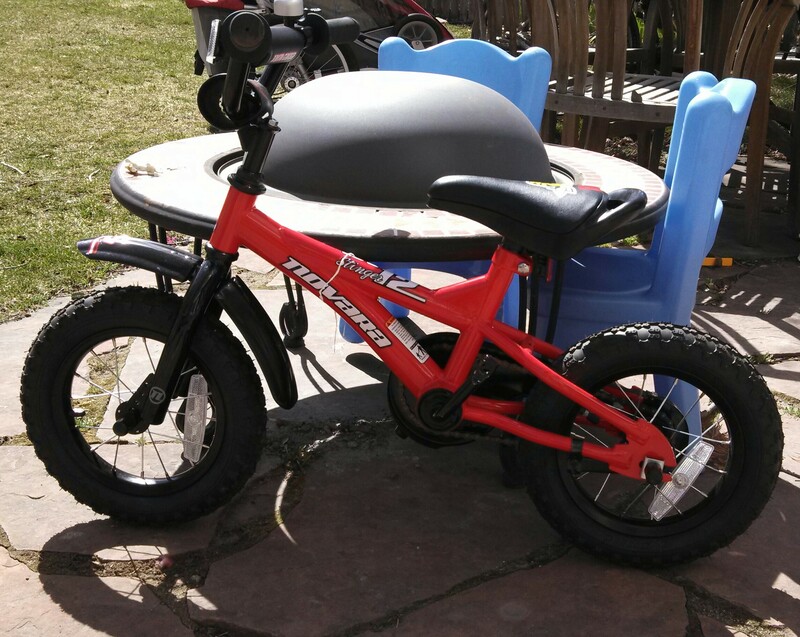 Maxon was finally motivated to ride his new bike, which even with the pedals removed is daunting since it is significantly heavier than his trusty Strider bike. It is also a taller than the highest setting on his Strider bike so he spent most of the ride pushing off with only his right foot. Coupled with the weight of the bike, he really struggled up some of the hills but he made it to dinner with no real complaints and no threat of giving up and getting in the bike trailer with Cooper. The ride home is basically a slow uphill journey and it made for a much slower trip with more sighing and frustration. Still, he pressed on and never hinted that he wanted to quit. I promised him that once we got to the ramp to get off the path before our house (intimidating by bike even for me) he could get off his bike and I’d carry it the rest of the way. Once we got to the ramp, he insisted on taking his bike up that last little bit but he wanted to go “off trail” and on the grass instead. I was ordered to continue up the path and to wait at the top. I figured he had a plan and the determination, so who was I to stop that? First he veered way off to the right where the slope looked much flatter and started his way up but soon got stuck when his strength and momentum gave out. I thought after the first try he’d be ready for me to take over so I started walking over to him and he quickly commanded I stay near my bike as he struggled with his. He continued, attempt after failed attempt. The sun was rapidly setting and it was getting darker and darker. Every so often I’d walk toward him and again he’d wave me away. His audible frustration. My mounting impatience. Exasperation for us both. Just as I was about to pull rank and shut the whole thing down, he gutted it out with all he had left in his little 4-year-old body and made it up that final pitch that initially defeated him and now held victory over. I had never seen him stick with something for so long and with such force. It was awesome. As promised, he did not have to bike the last block home. Glowing in his triumph under his oversized bike helmet, he ran the rest of the block home. I placed his bike on top of mine, utterly surprised at how heavy his bike really was. I walked them both home, heavy in my hands but light with such pride in my heart.